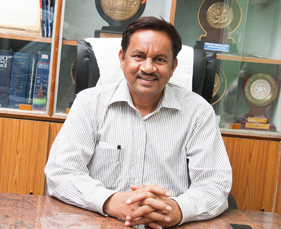 ..:: Sri.K.Goverdhan Reddy, Director ::..
My journey with the team at SRI TRIVENI School has started two decades ago when the school was in its transformative years and it has been exciting and challenging. I am happy that I have invested my time for a noble cause and could fulfil the dream of imparting those core values we could learn in our childhood to the younger generation. We at SRI TRIVENI strongly believe that learning is a never ending process and developing skill sets has to be in line with the needs and on par with the global standards. To ensure that our children are staying connected to the society while adapting to the trends, we have been continuously in search of various methodologies which shall address the needs of larger group. Our success can be quantified with thousands of successful professionals and entrepreneurs of this generation who were nurtured with sheer passion and dedication.